Across Ho Chi Minh City, Catholic churches dot the landscape. The largest ones serve as popular landmarks, drawing in gaping tourists by the busloads. At the small ones, locals quietly crowd in for Mass and services. For dedicated parishioners, the church remains a bedrock of their community. "We teach people to do good things, to open themselves. And you can see other people and help other people, making your life more meaningful every day," said Father Joseph Giang. "So many people really enjoy this kind of life," he said, when asked to explain the religion's sustained popularity. Though precise figures are hard to come by, the population appears to be growing. In 1954, Catholics made up approximately 1.9 million of the roughly 30 million population, according to research published by Father Peter Hansen, a lecturer at Australia's Catholic Theological College. Today, there are 6.2 million Catholics — 7 percent of the population. Unlike in the early days of communist control, the government tends to stay out of ecclesiastical affairs. While there are murmurs of officials axing names off of ordination lists, even those priests are permitted to quietly serve. And unlike in China, which continues to follow the model of government-appointed bishops, appointments in Vietnam are left in the hands of the Vatican. The greater difficulty for the Catholic Church today is handling a mercurial and far from monolithic government. What is permissible in some areas may be met with jail time in others. Authorities who look the other way for years might suddenly decide to crack down without warning. "We can organize catechisms, it's OK. We can accept new people, it's OK,” said a Jesuit leader speaking on the condition of anonymity, explaining that the current situation was a poor predictor of how things could go in the future. "If it's not open, we do what we need to do. It depends on the region, too. In Vietnam, it's very, very complicated," he said. Father Giang, a Redemptorist, said his work within the church never faced pushback from authorities but colleagues who did service on the outside at times faced problems. "If you want to act outside the church, you have to get permission," he said. Is that permission easy to get? "It depends," he said with a laugh. "Sometimes it's easy, sometimes it's hard." In the face of such challenges, clergy and laypeople alike strive to accept obstacles with equanimity. Maria, who has experienced five decades as a Catholic in Ho Chi Minh City, said she viewed difficulties as a test of faith. "It depends on each person's point of view, but in my point of view, if the government puts pressure on Catholics, it's because God wants it that way. God wants to train Catholics," she said. The Jesuit official offered a similar take. "We always have problems but we know how to live with them. That is one characteristic of the Vietnamese Catholics," he said. Hard though it may be at times, the church is clearly opening wide. 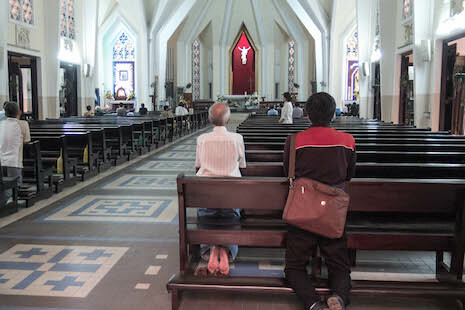 At The Most Holy Redeemer Saigon, there are 5,000 regular members and hundreds or perhaps even thousands more casual visitors. Seventy young men are studying to become priests and the church boasts 40 active priests — not including affiliated senior priests. The Jesuits alone have grown from 26 inside the country in 1975 to 234 now. "From 1990, we can receive new novitiates. Before [then, the number was] very low. This year there's 27 new novitiates — the biggest in the world in any given province," said the Jesuit priest. Across the country, kindergartens and preschools run by nuns have proliferated, normalizing the religion in the eyes of millions. "The communist party doesn't like religious organizations but the members, as humans, as individuals send their children to kindergartens run by the sisters. Before, they saw Catholicism not as good but over time they change their mind," said the Jesuit official. Now, with communist members' children returning home able to make the sign of the cross: "we have a problem, but the government has a problem too." For Catholicism's newest generation, the focus now appears far more on growth than obstacles. Phong, a 24-year-old studying to become a priest, said he felt the calling from the time he was a child. "I wanted to be a priest since I was little. Sometimes my friends ask why I want to be a priest and I joke 'because I always have so many girlfriends.' But the real reason is because I want to serve God," he explained, calmly. "Becoming a priest depends on your belief and your desire. You have to have a call from God. It's not like you can choose to do it like a job. It's a calling." If successful, Phong hopes he can see the religion grow. Asked if he thought Catholicism is growing, he replied with a question of his own: "how many people are in the world?" He paused and answered himself. "In the whole world there are 1.2 billion people following Catholicism, but in Vietnam, it's not so many."